I love Halloween and it’s always fun to create spooky little vignettes around the house during the month of October. I am not a gory/scary Halloween person, but I describe my decorating as “Poe Inspired” instead. Kind of creepy but not overtly scary… ravens, black and white color palettes with a small pop of color, just kind of eerie. My entry way and front porch area is always a fun place to create these little Halloween scenes. 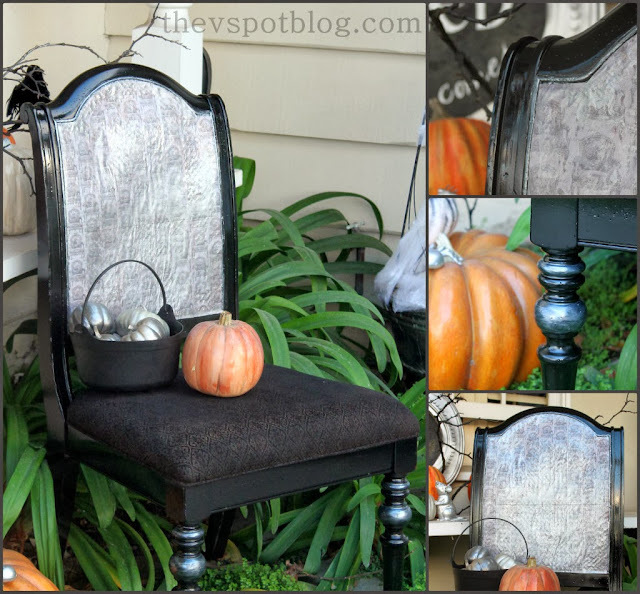 I was able to use several items from previous Halloweens, but this year I re-did a thrift shop chair and I’m calling it my “Sit for a Spell” chair and it fits right in with my black, white and silver decor. I used Outdoor Mod Podge, on the project, so I am comfortable leaving it out in the elements. (Not that Southern California has a whole lot of elements, compared to the rest of the country, but this holds up great!) 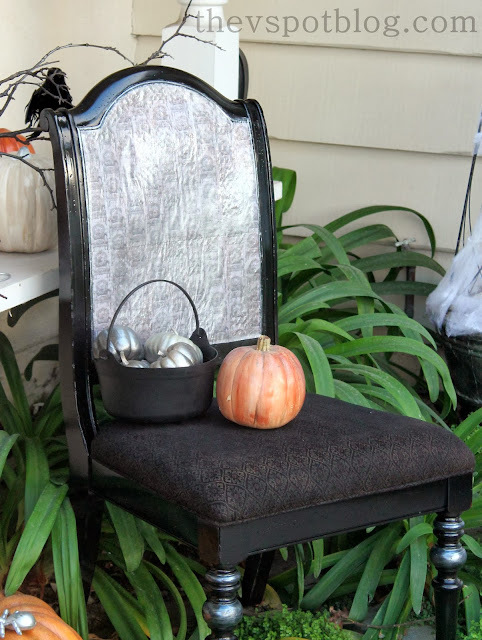 I’m kind of in love with this little Halloween vignette, and I am loving the chair, in particular. I bought this solid and heavy chair at Habitat ReStore for $20. I used basic, pretty much generic spray paint and gave the whole thing a good coat of gloss black… this included the upholstered seat. You can spray paint anything, including fabric. I was able to change this brown and gold fabric into a textured black fabric with several light coats of paint. I wanted to cover up the cane-looking back of the chair with this very cool scrapbook paper that had vintage chairs all over it. I made a practice pattern/template from wrapping paper, so I would know how to cut my good paper. Since the scrapbook paper was 12″ squares, I needed to use a couple of squares together to make one big piece for the back of the chair. Double sided tape helped to secure the pages (and keep the pattern lined up) so I could cut it into the shape I wanted. Ah, here is where the fabulous Outdoor Mod Podge comes in. It is a water-base sealer, glue and finish in one. It’s fabulous! I applied a generous coating of the Mod Podge to the back of the paper and placed it over the caned back of the chair. I pressed it down from the middle on out and then made sure the edges were secured with more Mod Podge. I then put a few nice coats of Mod Podge over the top of the paper, letting the coats dry in between applications. 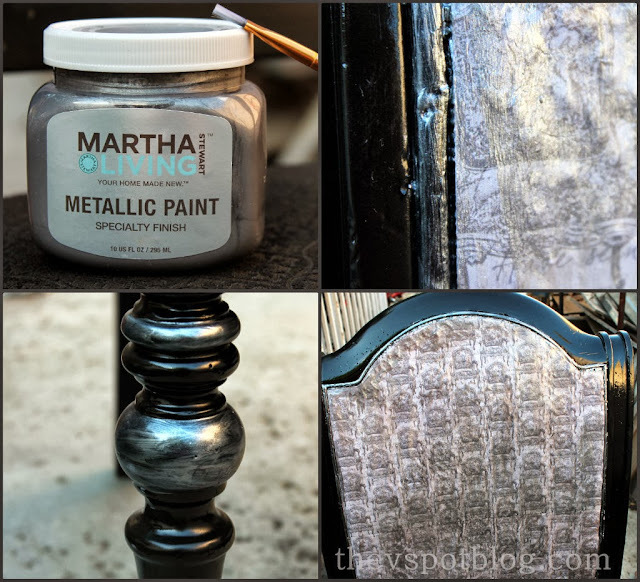 Once the paper was adhered and the top coat was dry, I used some of this fabulous Martha Stewart metallic paint in “Thundercloud” to add a bit of shimmer. I painted the line of woodwork around the edges of my Mod Podged paper, as well as highlighting a few details on the chair legs. I also put a light coat of the paint over the paper itself and then took a dry paper towel to rub it in and make it look a little aged and shimmery. I think it is so cool how the combination of the Mod Podge, the paper and that shimmery paint make it look like it is fabric. I wish I was a better photographer so I could adequately capture how cool this looks! I love the rest of the porch too. A friend came over yesterday and she said it was cool that you can’t really see it from the street, and then you get up to the door and it’s like a little Halloween surprise. That made me happy. If you’re looking for even more Halloween inspiration, there are tons of ideas on Plaid Craft’s Facebook Page or on their Pinterest boards. Follow along and get inspired. Here are some more great Halloween ideas. This post is sponsored by Plaid Crafts and the Blueprint Social. I received product to try and compensation. It turned out so fabulous!! I love the way the paper looks on the back and the black paint on the fabric is perfect. The whole entryway is so spooky and awesome! 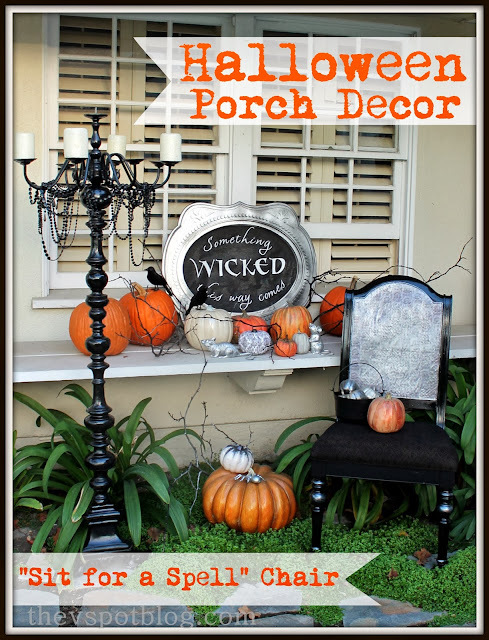 Love your Halloween decor! And that chair looks awesome! I love it VIv!!! And I don't even like Halloween 😛 You always pull things together so nicely. Wow your chair is amazing. I love the techniques you used. Great creativity! The while vignette is wonderful. 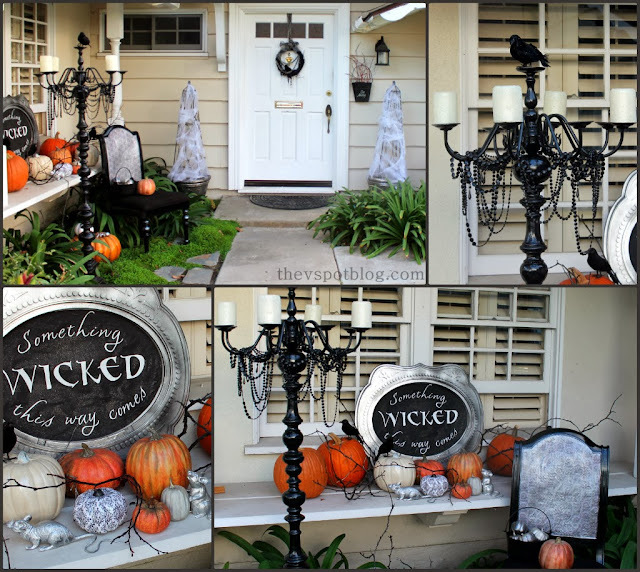 I love how glam this Halloween decor! I adore the Mod Podge chair and can't believe I didn't think of that! Great job!! That chair is just so cool! I mean 100% times 1000 cool! This turned out awesome Viv! Love your whole porch. So fun! oh my gosh I absolutely love how this all turned out! Awesome job Vivienne!I love the “newish” look of Halloween decor. Gives a whole new spin on it. And I adore you decor from last year. Love it all. Thanks for sharing.. I love it! I have a chair I wanted to redo for halloween. I guess I need to go get some metallic paint! Really cool Viv. You are amazing.